Spinner Harbhajan Singh has said India's cricketers are not opposed to drug tests but the World Anti-Doping Agency's (WADA's) clause to reveal one's round-the-year location, which he felt was illogical. Harbhajan is on the ICC's International Registered Testing Pool (IRTP) and was among the three cricketers who met ICC officials and subsequently expressed reservations about the WADA guidelines to the BCCI working committee last Sunday. "We are not against drug tests. They can test us every single day, before or after a match, before or after a net session, we don't mind that. We would love to have a drug-free sport. But is this the only way?" he told the Indian Express. The offspinner said he and his colleagues would accept what is decided at the ICC executive board meeting with BCCI and WADA officials. "We will follow whatever the BCCI tells us," he said. Responding to criticism by Indian Olympians of the cricketers' stance, Harbhajan said: "People should stick to their own business and not speak about what we should or shouldn't do, or teach us how to behave. We don't interfere in any other sports or speak of what other sportsmen should do." 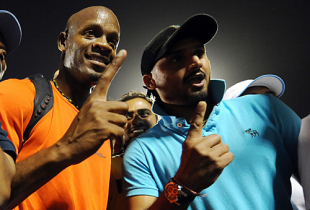 Harbhajan said he had been tested several times and never had a problem. "I have been tested at least 15 to 20 times… We are not against it. We are responsible people and we know what we have to do," he said.